Replacement screws to install door jambs vents. Door lock rod clip that attaches the door handle rod to the latch. Correct reproductions of the original quarter window roller guide washer used on all 1967-69 Camaro and Firebird models. Located on the bottom of the quarter window roller. Sold individually. Correct reproductions of the original quarter window roller guide steel washer used on all 1967-69 Camaro and Firebird models. Located on the bottom of the quarter window roller. Sold individually. Correct adjustment spring which allows the headlight bulb to adjust properly. One spring per mounting bucket. Trunk latch 9-piece hardware kit to install trunk latch in the trunk. These are the screws used to install the 2 front windshield glass stops, the 8 piece lower clips and the 2 outer clips on the lower windshield molding. Includes 12 screw. Rubber floor plug. 2" diameter and fits a 1-1/2" diameter hole. 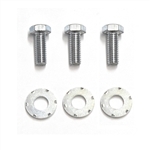 Original type replacement nylon nuts and screws for use on the front and rear license plate brackets. These nuts push into the bracket and allow the screws to be inserted into the nut. 10 piece stud repair kit. Use this kit to replace missing or damage molding clip studs. Rubber trunk bumpers 2 piece set. Fits: Camaro and Firebirds 1967 to 1981. Reproduction of the bellcrank retainer used on all 1969 Camaro and Firebird models. Two required to mount one bellcrank to door frame. Fits both RH or LH doors. This clip is used to hold the door lock knob rod assembly to the lower rod assembly which pivots up and down when the door lock knob is raised or lowered. Clip used to hold the inner locking rod to the inner door frame panel. Sold in pair. Reproduction of the quarter window lower center guide roller used on all 1967-69 Camaro and Firebird models. Guide roller is located on the bottom of the quarter window allowing window to lower and raise on track. This roller will help keep your quarter window moving evenly on the track and eliminate one side from rolling up or down unevenly. Sold individually. Technically correct reproductions of rubber license plate bumpers. Contains 3 bumpers. Blue colored embossed GM door decal plate used on all 1967 Camaro models. Accurate reproduction and self adhesive back. Licensed GM Restoration Part. Blue colored embossed GM door decal plate used on all 1968-70 models. Accurate reproduction and self adhesive back. Licensed GM Restoration Part. Reproduction rear rocker panel flap for all 1968-72 Camaro and Firebird models. Prevents road splash and debris from entering and blocking the rocker panel drain area. This flap mounts on the rear side of the inner rocker panel. Sold as a pair. Reproductions of the 1967-81 Camaro trunk lid hinge bolts used on all models. Kit includes 4 pieces. Window track upper plate. Does both RH and LH side. Reproductions of rubber license plate bracket. Contains 3 bumpers. Don't use those old rusty bolts to install your new headlight housings. Replace them with new hardware. For use on all1969 Camaro models. Kit includes 8 pieces. Door lock rod clip, washers and screw set. Be sure to include these door latch screws when replacing or repairing your door latch. Original screws are sure to be rusted, and could break off when removing the old latch. Save yourself the headache with this 6-piece door latch screw set that does both door latches. Fits most GM vehicles through 1981. Copyright © 2014 Southern Camaro LLC. All Rights Reserved. Ecommerce by Volusion.